Toward the end of 2018, I gave considerable thought to how people -- myself included -- spend time online. Around the December holidays, for instance, I experimented with a 48-hour Instagram "cleanse." In January, I measured which social media networks consumers expect to spend the most (and least) amount of time this year. And, I collected data on sentiment toward the power held by Big Tech companies, and the effect they believe it has on users. 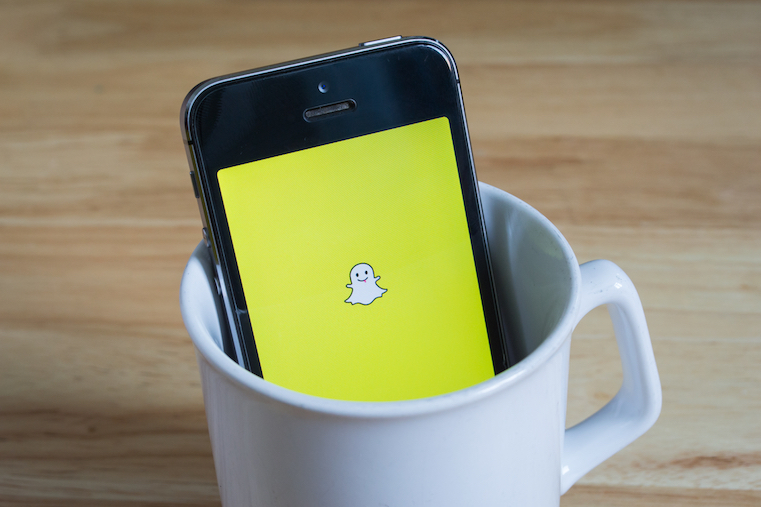 At the root of all these stories was, arguably, a curiosity of how time spent online can impact our collective and independent wellbeing as users of digital products and apps. Is it positive? Negative? Much of the time, I found that it was a mix of both. 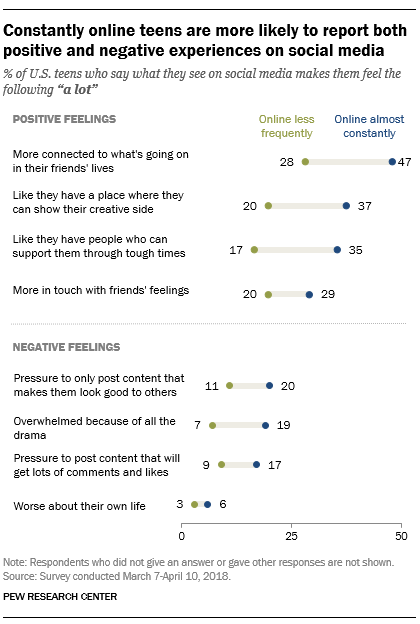 Only recently did it come to my attention that, while I was analyzing this data, the Pew Research Center was conducting a similar study of its own -- specifically, on how being online "almost constantly" could impact the interpersonal relationships and emotional wellbeing of teens. Here's what that study found -- and what it says about how the use of online platforms effects all of us. Among other factors, researchers wanted to measure how much teens who say they're online "almost constantly" connect with their friends offline -- or "in person" -- compared to those who describe themselves as online "less often." When considering the outlook of many regarding the longer-term impact of increased screen time over the past few years -- from the projected loss of opportunities for in-person interaction, to a correlation between more screen time and lower mental well-being -- one might expect teens who report being online more often to also indicate spending less time offline with friends. 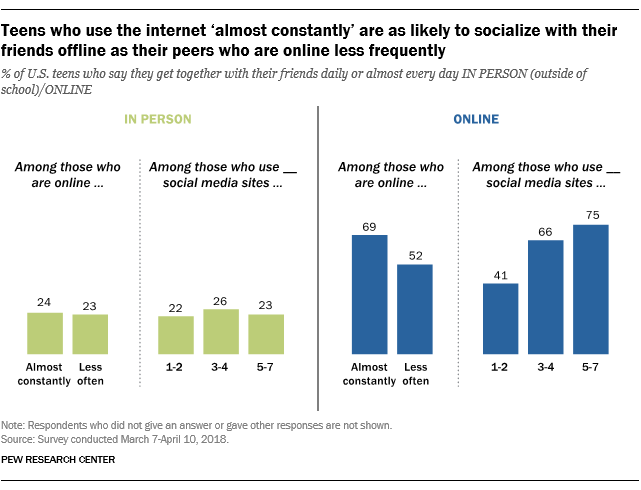 Instead, the percentage of teens who say they see friends offline daily, or almost every day, is almost equal among those who say they're online almost constantly (24%) and those who report being online less often (23%). Teens who use multiple social media apps -- between three and four of them -- also comprise the highest percentage of respondents who see their friends almost daily or more (26%), compared to those who only use one or two such apps (22%). Overall, it seems that teens who spend this large amount of time online indicate feeling more connected to friends overall. Less surprising is the high percentage of teens who say they're online almost constantly who also indicate interacting with friends online almost daily -- which weighs in at 69%, versus the 57% of those who report being online less often. This online interaction among teens is even higher for those who use the highest number of apps, with 75% of those who use between five and seven social media apps indicating that they engage with their friends online almost daily. Among those who use fewer social media apps, accordingly, a smaller percentage of respondents reported engaging with friends online with this amount of frequency. While a growing amount of interaction with friends online could come with negative connotations -- given the onset of such headlines as, "Is Screen Time Toxic for Teenagers?" -- teens participating in the Pew study reported some interpersonal benefits to spending more time online. For instance, those who reported being online "almost constantly" also indicated a higher rate of feeling more connected to what's happening in their friends' lives, an ability to express their "creative sides," seeking social support during difficult experiences, and having a better understanding of their friends' feelings -- an important indicator of empathy development. However, as per the chart above, teens report drawbacks to a constant online presence -- many of which resonated with my own findings after I, an adult, experimented with the before-and-after impact of a brief social media cleanse. Similar to my own experience, 6% of teens who report being online almost constantly said that this time spent on social media made them feel "worse about their own life" -- which, at the time of my experiment, NYU Stern associate professor of marketing and Irresistible author Adam Alter chalked up to "being flooded by the best 1% of all moments experienced by the people you follow, which is enough to make you question the quality of your own time." That sense of inadequacy that can follow social media use points to the pressure reported by constantly-online teens to only "only post content that makes them look good to others" (20%), or "content that will get lots of comments and likes" (17%). These figures, as one might expect, were higher than those reported by teens who say they're online less often. The risk of posting content on social media (the gamble) comes with the only possible outcome of receiving positive interaction and feedback (the reward). 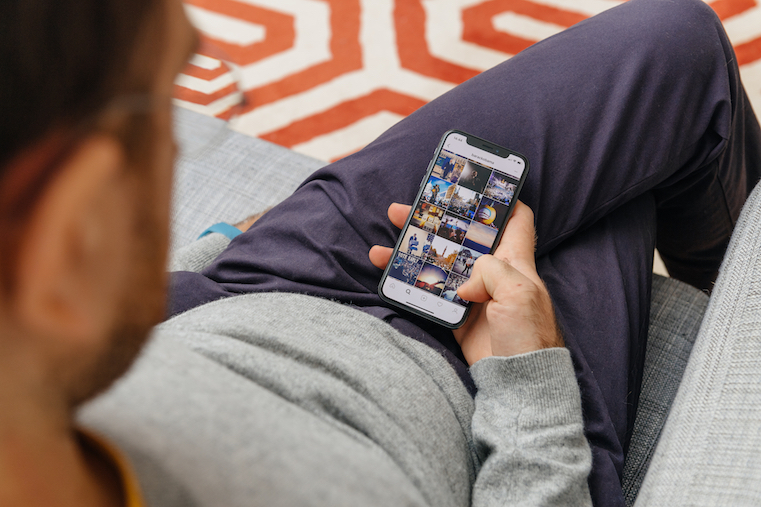 That latter statistic -- the pressure to post content that will receive a high quantity of likes and comments -- aligns with Alter's likening of content-sharing on social media to an activity like gambling, in the Social Media & Screen Addiction Masterclass that he created for Calm, a meditation and mindfulness app. The pressure reported by Pew's study participants fundamentally resonates with the concept of risk-and-reward: the risk of posting content on social media (the gamble) comes with the only possible outcome of receiving positive interaction and feedback (the reward). All in all, it seems a constant presence online carries both positive and negative outcomes for teens -- a phenomenon that Dr. Laurie Paul, a psychologist in the Washington, D.C. area, has observed in her practice. 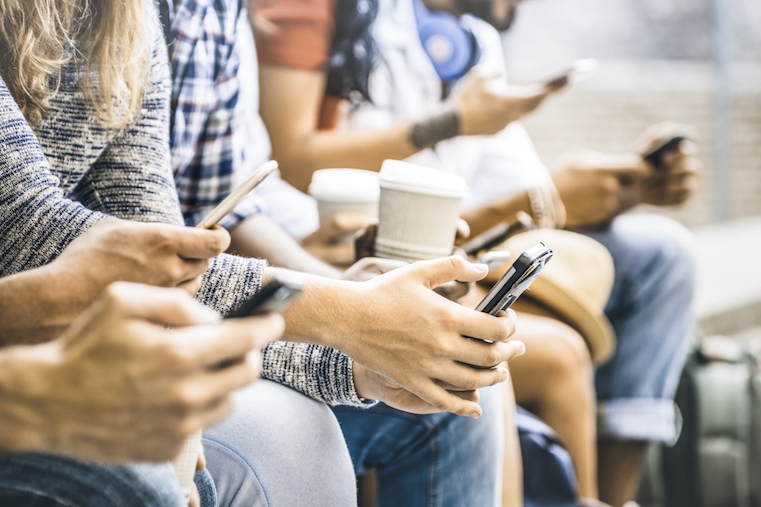 "Among my patients, I’ve seen teens use social media as a resource to connect with friends that enhances the in-person interactions," Dr. Paul explains. But at the same time, Dr. Paul has observed the emotional drawbacks of social media use among teens, such as bullying and feelings of isolation. 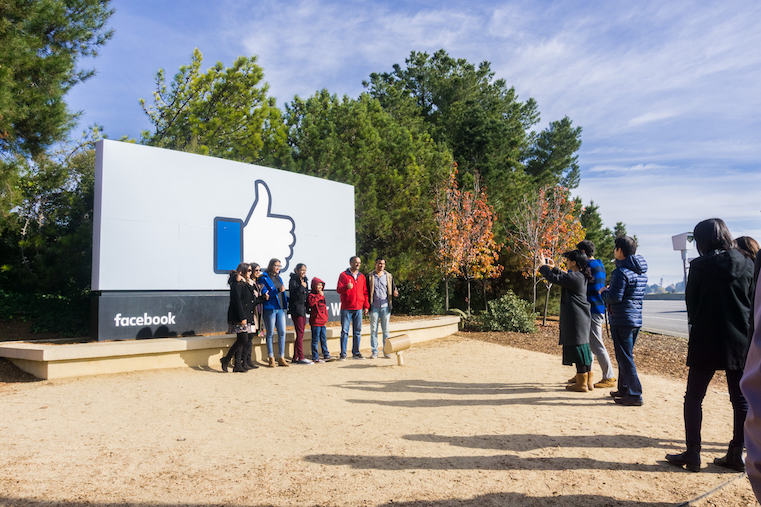 "For instance, [let's say] a friend writes a nasty comment about them," says Dr. Paul. "I’ve seen a number of teens see photos of peers having fun at a social gathering that they weren’t invited to, and this can make them feel anxious and angry, and question how much they are liked or belong in their social circles." That latter outcome of questioning one's sense of belonging returns to the pressure teens reported feeling to post content on social media that only portrays the best versions of themselves -- and feeling inadequate as a result of seeing posts from peers who do the same. 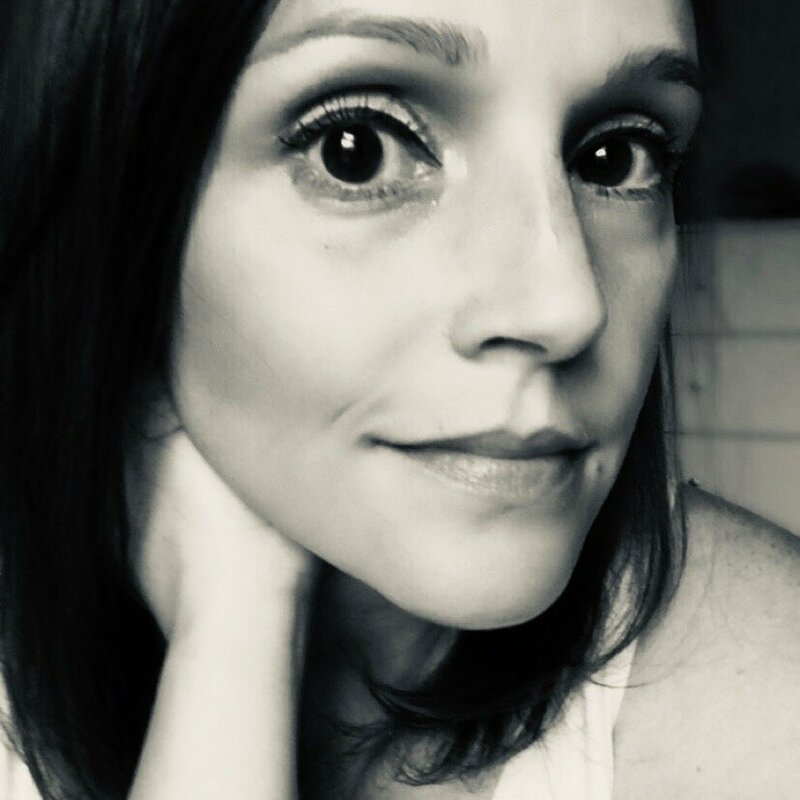 "When peers portray idealized versions of themselves on their social media profiles, I’ve seen this evoke envy and self-doubt about the quality of one’s own life." "When peers portray idealized versions of themselves on their social media profiles, I’ve seen this evoke envy and self-doubt about the quality of one’s own life," Dr. Paul reports -- adding that some teens report feeling "anger, if they feel that they can’t relate to that person anymore, because their lives appear to be 'so amazing'." It raises the question of how social media users -- teens especially -- can create a balance of results of spending time online. What are some actionable ways that teens (and adults, for that matter), I asked Dr. Paul, can emphasize these positive experiences of social media use while maybe cutting back or putting less weight on the negative outcomes? "Parents and other adults can teach teens about being media savvy- looking at social media with a critical eye," Dr. Paul suggests, such as "how someone’s social media profile can be highly curated and may not reflect how their life really is, motivations for portraying an idealized self online. But perhaps above all, Dr. Paul recommends looking inward and giving consideration to what's behind these pressures felt by teens who say they're almost constantly online -- and why they're spending that much time online in the first place. "Help them be self-reflective," Dr. Paul says, on the "emotional reasons" for this behavior.